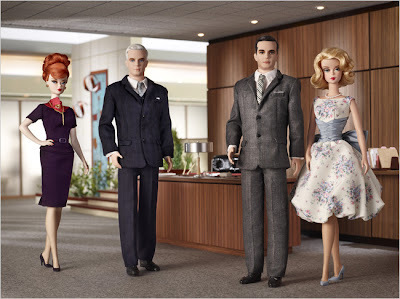 What can I say- love the show, can't stand Barbie...... but how do we feel about Mad Men Barbies? A Barbie story, our daughters where given some Barbies ( despite our objections-yes grandma that was you), we were concerned about the image they portrayed to our young girls. They played with them for a while and then decided to throw them out their bedroom window onto the porch roof below. For months afterwords we would suddenly see a naked Barbie lying on the ground in the yard after a perilous fall. I guess we won the Barbie debate.